And so it comes to an end. The final chapter of the phenomenally successful Harry Potter series is nigh. The seventh and penultimate film adaptation of the series of novels signals the film franchise’s imminent 10th year in existence, and with it comes the inevitable and insatiable hunger for pure unadulterated fantasy and adventure. For a series approaching its eighth iteration, Harry Potter has shown remarkable endurance in an ever-changing and unremittingly demanding industry. One staggering measure of its success is the fact that over the course of the first six films, the gross revenue has amounted to approximately $5million, a figure that is over four times the total budget for the six films. Such financial returns are the result of a synergy of numerous people and circumstances. The immense popularity of the novels is a good start, but purely in terms of film, the way in which the themes and tone of the series has developed ensures audiences never grow weary of the magical adventures. From the optimistic and upbeat tonality of the first films, the series has taken a gradual turn into darkness. As the audience has grown up with the characters themselves, they understandably demand a more complex narrative that is of a more mature nature when compared to the earlier films. With this evolution the score has similarly been transformed, out of necessity. 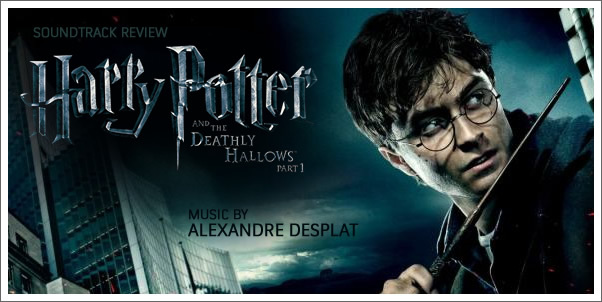 ALEXANDRE DESPLAT's efforts heard in part 1 of THE DEATHLY HALLOWS continue the descent into darkness.